Elements Applied: The stems of the blossoming period, and the leaves are commonly applied in herbal medicine. Tannins, including mostly ellagic acid glycosides. Used For: The remedy is applied to treat diarrhea, induce urination and menstruation, heal sores, and reduce inflammations. 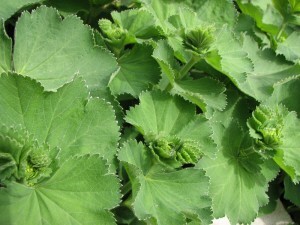 Lady’s Mantle and other types of Alchemilla have gained great popularity across Europe. Lady’s Mantle is applied for eliminating spasms associated with menstruation. It is also used to prevent abnormal bleeding. The remedy is potent of relieving menopausal symptoms. The remedy provides sufficient menstruations in case of their irregularity. Moreover, the plant is additionally used with the opposite aim, namely, to prevent metrorrhagia and menorrhagia. This property to prevent bleeding is also used to heal ulcers and sores occurring in the mouth, and treat laryngitis. Commonly mixed with: Compatible with the majority of medicines. Additional Info: Native to Europe. Belongs to a family of numerous species, commonly perennial plants, 10 inches high on average. The plant blossoms in summer period, when yellow or green flowers appear. Preparation and Intake: To make an infusion, take 2 teaspoons of dry herb extract and fill it up with 1 cup of boiling water. Let it stay for 15 minutes. The result is taken thrice a day. In order to fight diarrhea or produce a potent mouthwash, the herb is boiled up for several minutes, to release the tannin. In form of tincture the extract is used in a quantity of 1-2 ml thrice per day. Safety: There is no data concerning the plant’s safety level. Still, there is a possibility of interaction with chemical remedies. Have a consultation with your health-care provider before application.